The College will host the Twin Ports Choral Project for a performance at 7:30 p.m. Friday, Feb. 24 in the Mitchell Auditorium on campus. The Twin Ports Choral Project is a 24-voice ensemble that sings to inspire, engage, and educate audiences by sharing innovative and informed choral music performances. 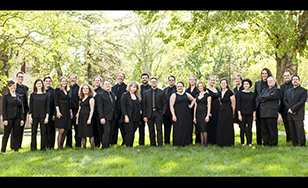 They will perform a diverse set of demanding choral repertoire. Join the Twin Ports Choral Project for an evening of outstanding choral music as the group performs composer Morten Lauridsen's "Mid-Winter Songs" and other works that will warm listeners' hearts during the cold mid-winter. Highlighted composer Lauridsen was inspired by the works of English poet Robert Graves. Lauridsen's music evolved from five of Graves' works that center on a "winter" theme, illustrating the cycle of dying/rejuvenation, light/darkness and sleeping/waking that marks the changing of the seasons. Other featured composers will include Giselle Wyers, Eric Whitacre and Claude Debussy. Bret Amundson, director of Choral Activities at St. Scholastica, is director of the choir, and alum Emily Valine is the pianist. Tickets are $10 general admission and $5 for students. For more information, visit spotlight.css.edu or call 218-723-7000. The concert is part of St. Scholastica's Cambiata series, which celebrates changing styles and the enduring value of music. The 2016-17 Cambiata season concludes with "The Secret Life of Children" with percussionist Jeremy Craycraft in a concert paying homage to parenthood, at 7:30 p.m. March 4.